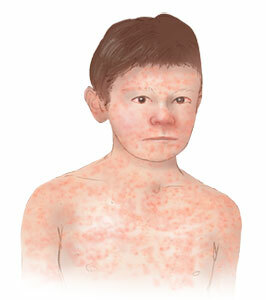 Rashes in children are fairly common (especially in the first few years of life) due to under-developed immune system. In most cases, the cause is self-limiting and rashes resolves spontaneously without requiring a treatment; however, if your baby is experiencing troubling symptoms that may suggest an ongoing infection or illness, seek immediate medical attention. The text below highlight some common causes of rashes in children. However, it is highly recommended to seek medical attention instead of self-diagnosing or managing your child at home. Chickenpox is a contagious viral infection that is transmitted via droplet infection or physical contact from sick or infected individuals. 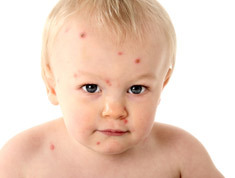 Typically, a child develop chicken pox lesions within 15 to 20 days of exposure. Symptoms: During active infection, babies may develop acute illness marked by high grade fever, spreading rash (starting from groin and armpits to rest of the body), sore-throat, malaise and irritability. The rash changes into blisters and eventually get crusted before complete resolution. Babies who have poorly developed immune system, pregnant mothers or babies with HIV are more likely to develop severe disease. Rash usually resolves without any complications and treatment is mostly supportive (management of fever symptoms and cold via over the counter medications). If the child develop active lesions around eyes, nose or other sensitive area or develop acute illness that affects the food intake, see a healthcare professional for guidance. Healthcare providers advise measles vaccine at the age of 12 -15 months (in the form of MMR) to prevent measles in children; yet some babies develop active infection after exposure to an infected case. Symptoms: The cardinal features of infection are fever, sore-throat, red eyes, irritability, signs of upper chest infection and lethargy. At about the 4th day on onset of symptoms, the child develops rash that usually starts around the facial region and spreads to involve the entire body. The symptoms begin to subside after the 7th day. In most cases, the treatment is only supportive (management of cold and fever). In some rare cases, children may develop secondary infection of glands and lymph nodes in which case, antibiotics may be needed. 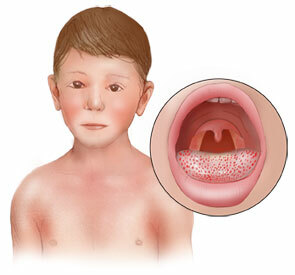 Symptoms: The pink rashes of German measles typically start around face or neck region and spreads to involve the body. In most cases, baby appear quite well but in some cases, lymph node swelling is also reported. The risk of infection can be reduced several folds by introducing MMR vaccination at an early age. This is another contagious infection that is caused by transmission of streptococcal bacteria from sick contacts is usually reported in school going children. Although most cases are reported in spring/ winter season, infection may occur during any season. Symptoms: The symptoms begin with high grade fever, sore throat, abdominal pain and swollen lymph nodes. Within a couple of days, these symptoms are followed by sand-paper like rash that involves the entire body. In most cases, the rash begin to resolve within 2 weeks by sloughing of skin. The characteristic symptom of scarlet fever (besides sand-paper like rash) is flushed face in the presence of normal body color. Treatment involves antibiotics to prevent a worrisome complication, Rheumatic fever and rheumatic heart disease (that is reported in approximately 2 to 7% cases). The potential complication of untreated or poorly managed seborrheic dermatitis is a higher risk of worsening skin infection due to persistent irritation or scratching. Most cases have a genetic predisposition with a tendency to run in families. 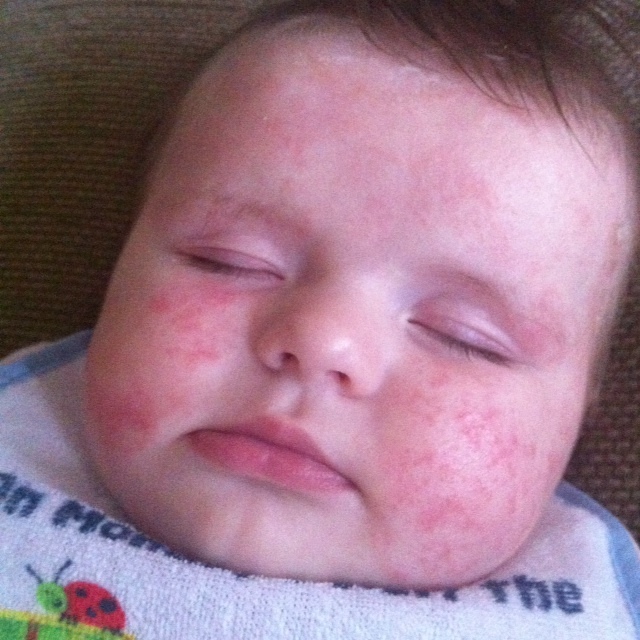 Babies who have oily skin are more prone to develop this type of rash. 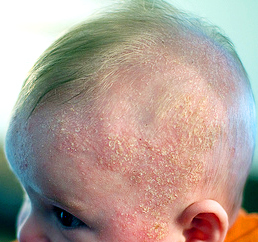 Symptoms: Seborrheic dermatitis is marked by appearance of scaly, patchy irritating rash that may occur at any age. The active lesions may appear red or yellow in color and may mimic the rash of atopic or allergic dermatitis. Seborrheic dermatitis can be differentiated from other rashes on the basis of oily, waxy appearance. Eczema is classified under inflammatory or allergic conditions of skin that is not contagious per se. 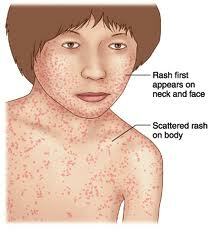 Symptoms: The rash appear dry, while scaly under normal circumstances; however, in periods of flaring, the rash may appear red, inflamed and itchy raised lesions. Most popular treatment is topical steroids that help in reducing active inflammation. In order to reduce the risk of recurrence, keep the skin moisturized. The superficial red blistering of skin in impetigo is caused by the bacterial agents: streptococcal or staphylococcal that are more likely to infect abraded or damaged skin (due to eczema, contact dermatitis or poison ivy). Symptoms: The red rash is transformed to honey-crusted rash (characteristic of impetigo) and can spread to others in physical contact. Most cases heal spontaneously within a week. 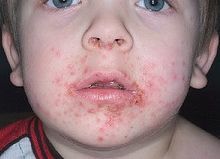 Impetigo is highly contagious and so contact with the baby suffering from the condition should be avoided. In serious situations, antibiotic is prescribed. Exanthem subitum (popularly known as Roseola) is another infection that is characterized by pink, slightly raised rash that is caused by human herpes virus (strain 6 and 7). Most cases respond spontaneously requiring only supportive therapy for fever and sore-throat. Hand, foot and mouth disease is caused by a viral agent that causes a non-itchy rash, commonly involving hands and feet. Often times face is also involved. The infection clears within a few days without treatment in children with intact immune system. In areas of extreme heat and humidity, the ducts of sweat glands may get clogged and inflamed; resulting in prickly heat rash that is characterized by very small bumps or rashes that may appear solitary or clustered. Most cases respond almost immediately to calamine lotion or prickly heat powders/ creams. Poor hygiene and prolonged exposure to wet nappies (filled with pee and poo) can lead to skin irritation that may even ulcerate in poorly managed cases. Keep the skin of buttocks dry and apply over the counter ointments to reduce inflammation. Certain perfumes, ointments, chemicals, baby care product ingredients and other similar products can leads to allergic reaction of skin. Correct method of management involves identification of allergens and preventing re-exposure. Ringworm is fairly common in general population and is caused by fungal agents that may invade scalp, groin or extremities. Most cases require prescription agents.